1. The theme park is 8 inches long and 20 inches wide. ﻿The Rides space should be as wide as the theme park but half the length of the theme park. What will be the area of the Rides space? 2. Divide the rest of the land into two equal halves. 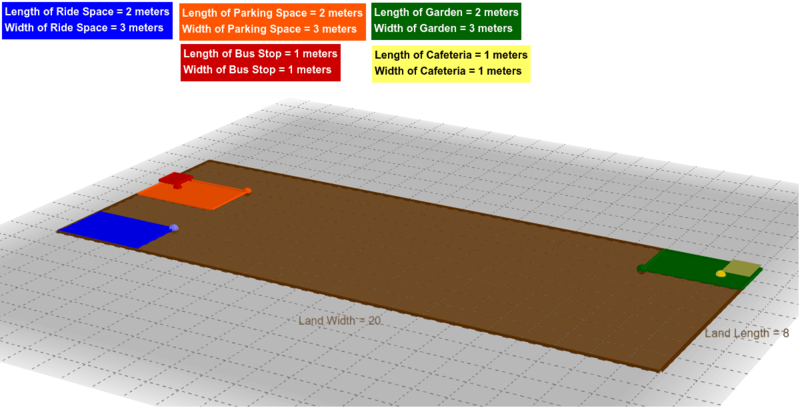 In one half, create a parking space and in the other half, create a garden.﻿ a) What is the area of the parking space? b) What is the area of the garden? 3. ﻿I would like to build a cafeteria in the garden. The area of the cafeteria should be 1/4th of the area of the garden. What would be the area of the cafeteria? What would be the length and width of the cafeteria? 4. Oh! I heard that we have to provide some space for the bus stop as well. I have decided to use 1/5th of the parking space as the bus stop. What is the area of the bus stop?